This is a compilation of links related to using films in TEFL. Movies and television shows can be an effective tool for teaching and learning English (or, for that matter, any academic subject) if used strategically and not as a "babysitting" device. I thought it might be useful to prepare a "The Best..." list sharing resources that teachers might find useful related to using video in the ESL/EFL classroom. This is a summary of the #eltchat which took place at 9pm (GMT) on Wednesday 28 March 2012. It was contributed by Steve Muir @stevemuir https://twitter.com/# !/stevemuir Apart from the odd occasion when I've lurked a little, this was my first #eltchat since I started using Twitter just over a year ago. Welcome The main purpose of this blog is to share activities to enhance the teacher's lesson plan. They will not replace the course book, but they will make the lessons more attractive and richer. Share your warm-up activity with movie segments too. 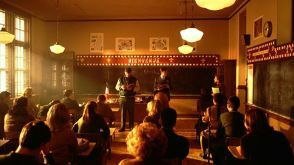 Real teacher blogger Mr.Z shares his secrets to making the most out of showing movies and documentaries in the classroom. I wrote this article for a Brazilian online ELT magazine ( Brand New Routes), and I share with you: by Vanessa Prata Many times we teachers found ourselves running out of ideas to motivate the students, bring variety to the classes and integrate all the skills in a single lesson. Study / teaching materials for movie / film English. Free worksheets, listening and online quizzes. All Videos Tagged film | English Language Learning and Teaching. ESL, EFL, TEFL, TESOL, and students. Teacher's note; the worksheet below was designed to be watched in a computer room as an individual student activity. It is quite long (the opening 30 minutes of the film) and revises present simple for habit. The English Learer Movie Guides, which are an innovative tool in the learning of English as a Second Language (ESL). Each guide reviews one popular movie, with a plot summary, list of major characters, and an extensive glossary of vocabulary and cutural references. Film as Genre| | Movies by Title| Analyzing Motion Pictures This 1-page teacher guide offers questions for students who are analyzing movies. From the U. S. Library of Congress, requires Adobe Reader for access. Camera Angles How are a three-shot, a canted angle shot, and a dolly shot different from one another? mELTing Activities, Lessons and Ideas: But I don't have time to show a movie!!! I know a lot of teachers who don't show films in class due to the time constraint. Filminute has 25 different films all chiming in at a minute! You can use them as listening activities, attention getters, things for students to describe, or inspiration for your studens' own events! Guess the movies--Can you guess them all? TIME analyzed 242 best-picture nominees to create an algorithm that generates story lines for Oscar-caliber movies. In honor of the 2014 Academy Award nominations, which were announced Thursday, TIME took the 242 movies that have been nominated for Best Picture since 1970 and melted them down to their constituent parts.